What Can Be Found Inside Batman’s Utility Belt? Being a superhero can be tough, especially if you don’t have powers. Characters like Batman need to rely on their intellect and one of the Dark Knight’s defining costume features is his utility belt. The belt carries all of his crime-fighting tools and gadgets. The belt is made up of a strap and buckle with ten pouches or cylindric cartridges attached to the outside. The belt has a history that’s as old as Batman, with artists adding to it over time. Originally, it was drawn as a simple yellow belt, but in 1986 Frank Miller incorporated militaristic pouches. But what exactly can be found inside the belt and how does Batman apply his gadgets? The Comic Vault is taking a look at the importance of the utility belt. The Batarang is the Dark Knight’s most recognisable gadget. Similar in appearance to shurikens, the batarangs are collapsible and a large number of them can fit inside the belt. Batman uses different variations, which include explosive, electric and remote-controlled batarangs. The remote-controlled variety are interesting because they’re used when a straight line of sight isn’t possible. Batman’s bolas are made up of a composite nylon cord. Strong, light and flexible, the bolas make excellent neutralisation weapons. They can be used to stop a criminal from escaping by wrapping around their feet. This can be followed by an electric charge that Batman activates via his gloves. Batman’s grappling device is made up of a high-tensile cord that can attach to various surfaces. A claw-like projectile can be found on the end. The grappling hook is one of Batman’s most versatile gadgets, with him being able to scale buildings and use it on criminals as well. For example, he can pull a gun out of a shooter’s hand or drag a target towards him. When Batman wants to cause a distraction he relies on smoke pellets. The pellets release a thick mist and provide an opportunity for stealthy entries and exits. This smoke pellets are used in tandem with Batman’s cowl, as his lenses can clearly see through the smoke. The Caped Crusader also uses gas pellets to incapacitate opponents. Nerve, anaesthesia and regurgitant agents are released when the pellets are broken. Batman often finds himself in situations where he’ll need to go underwater and that’s where his rebreather comes in. The compact device is small enough to fit inside the utility belt and contains enough oxygen to last 2.5 hours. The Dark Knight relies on his impact mines to destroy large vehicles or walls when necessary. They work on a timer, while the pellet grenades blow up as soon as they make contact with a surface. The glue goblets are made of a strong, sticky adhesive. They’re used to encase an opponent and make it harder for them to move. Batman has used these to great effect on a group of enemies and larger opponents. This special incendiary gel is kept inside small packets. When broken open the gel sticks to a surface and sets it on fire. Much of Batman’s tactics rely on his ability to instil fear into his opponents. His bat beacon emits sonic waves that can attract thousands of bats to his location. They swarm around him and promote his image as a supernatural creature. This device releases powerful sonic waves that can shatter glass or debilitate foes. Batman’s cowl features a built in sonic dampening system to make sure he remains unaffected. One of the compartments on the utility belt is lined with lead. It houses a piece of kryptonite to be used against hostile Kryptonians. The utility belt features a built in security system to stop it from being used by enemies. This takes the form of a powerful electric charge that can stun anyone foolish enough to try and open the compartments. There are a couple of great infographics to show Batman’s utility belt in greater detail. One of the best I’ve seen is by Kevin Tong, which was rejected for the MONDO Batman 75 Show. Batman’s utility belt is as a representation of Bruce Wayne’s intelligence and ability to adapt to whatever situation he finds himself in. 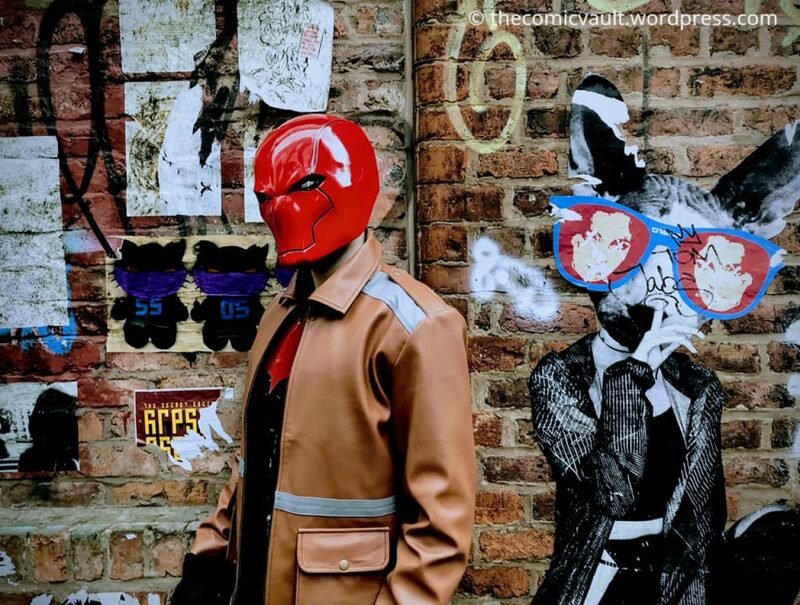 Another character who relies on gadgets is the Red Hood. Check out what can be found in his armoury and how he uses his weapons to fight crime! It does add to his mystery for sure! I’m sure he’s got that in there somewhere. Definitely one of the coolest things about Batman. And certainly one of the reasons why I love his character so much 😀 Great post! Previous Previous post: Black Bolt Vol 1: Hard Time Review: How Do You Make A Silent Character Relatable?